Country Crossroads, designed by Nancy Rink is a beauty! This 9-month BOM features soft florals, textures and ombres in shades of antique blue, buttermilk and mocha from the Pointe Pleasant collection by Marcus. The applique shapes are large which lends itself to simpler machine applique techniques or great for those new to hand applique. Kits will include pattern, all fabrics for the 100" x 100" quilt top and binding. 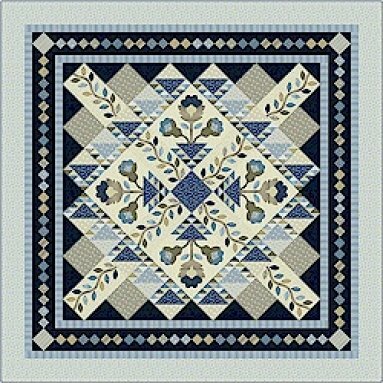 Block of the Month (BOM) programs are a fun and easy way to make a quilt that is generally a long-term project. By participating in a BOM you have the ability to make some wonderful quilts in "bite size" pieces. Each month a block is kitted with fabric, cutting and sewing instructions to make the block. At the end of the BOM program you simply need to add borders, quilt and bind to have your project completed. BOMs do require a committment of picking up your block each month and purchasing the kit monthly. OQB has several Block of the Month projects in place right now. More to come soon. We will post each new BOM project along with costs, number of months and other pertinent information needed.